The black FUSION 3 x 3 Micro-Adjustable Large Freestanding Video Wall Cart from Chief allows you to construct video walls in prominent locations for temporary applications. The screen array configuration is 3 screens wide by 3 screens high. To confirm the compatibility of this mount with your projector, visit Chief's MountFinder Pro. 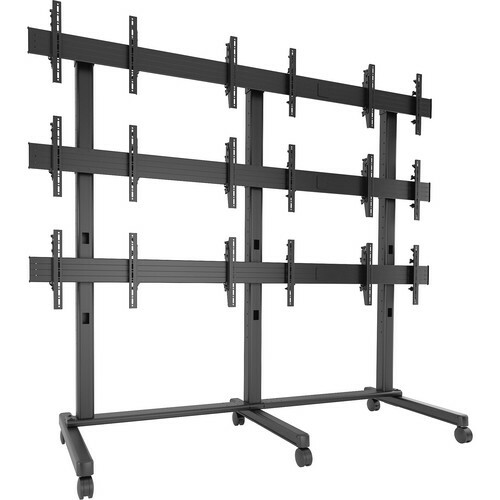 Box Dimensions (LxWxH) 75.0 x 39.0 x 9.0"
FUSION 3 x 3 Micro-Adjustable Large Freestanding Video Wall Cart for 42 to 46" Screens (Black) is rated 5.0 out of 5 by 1. Rated 5 out of 5 by Road Runner from Definite Repeat Purchase! Great product. Easy to put together.